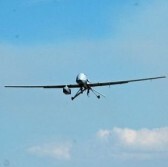 The U.S. Army has released a request for information to gather input on potential electronic warfare technology for unmanned aircraft systems. A FedBizOpps notice posted Oct. 3 stated the military branch seeks a Multi-Function Electronic Warfare system that can be mounted on the wing pylon of Class IV UAS such as the Gray Eagle platform. The Army aims to build the MFEW system through a commercial/government off-the-shelf approach, then start prototype deliveries 18 months after the planned contract award to begin qualification tests and UAS integration. Col. John Lanier Ward, director of the Army’s Rapid Equipping Force, told Defense Systems in an interview published Thursday that the service branch is changing its perception of EW, including doctrine and organization, in an effort to close a gap in EW technology. Ward added that new EW platforms can be acquired in the near future through improved antenna, software or amplifiers as well as through new applications or integration methods.